In the course of saving the universe and making sure Kingdom Hearts stays locked up, Sora encounters a lot of people and monsters who are determined to make that job difficult for him. In part II, we continue to look at villains who are less threatening than they make themselves appear to be. These are characters who are, more or less, disposable in the main course of events as far as far as their actions go, because they either don’t stick around for very long or do not significantly affect the course of the rest of the villainous plotting. 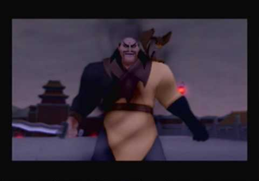 Shan Yu was always a quiet villain, but in Kingdom Hearts II he's practically mute! Just another boss to fill the quota. After our adventures in Twilight Town, The Land of Dragons is many people’s first experience in a brand new Disney world in Kingdom Hearts II. Things started off mellow—we met Mulan and Mushu, who became party members and together, we suppressed the new Heartless threat surrounding the Imperial City. The new Heartless had unexpected attack and magical prowess; some specialized in blizzard magic while others threw explosions into your face. Compared to the true force of darkness, though, these were just small fry. Looking on at the Imperial Army’s progress was Shan Yu, leader of the Huns. The first time that we glimpsed Shan Yu was at the base of a snowy mountain, where he summoned electric-type Heartless that swarmed our party. After that encounter, we knew to look for Shan Yu whenever we caught a sight of his messenger hawk. Just how many times did we see Shan Yu in total? Including our match with him, was it 3 or 4 times? And each time he roamed just at the edge of our vision—at the top of a mountain or creeping over a roof at the palace. That greasy-haired goon was always one step ahead! We perpetually chased him from camp to palace and what happens when we finally come face to face in a death match with the blight of China? We didn’t need greetings or forewords. Real men lock swords on sight and fight to the end! Shan Yu was not interested in small talk, big talk or talk of any kind. It didn’t bother him that outsiders of the world were involved in the rescue effort, nor did he wonder what odd weaponry we possessed that could pummel his outdated sword. Over the course of the game, Shan Yu said no more than 5 words, which he muttered to the emperor at swordpoint: “Now you’ll bow to me.” Then he grunted and laughed. Shan Yu was what I call, a shy villain. He escaped from Sora a lot, and enshrouded his tactics in secrecy. Well, infiltration is part of the invasion strategy, but having been cornered, a few choice words from a feared villain would have been appropriate. As a general rule, villains enjoy talking down to their opponents. They don’t have to be especially talkative, but having the mark of a villain meant that you boasted your fighting plan to your opponents, or told us we were just another set of annoying ants fit for being crushed under a big winter boot. Not the most charismatic of villains, though Shan Yu proved to be challenging to defeat. I remember Scar from The Lion King as one of the cruelest villains in the history of Disney. What took the cake was his terrible betrayal to his family and to his fellow lions. He was not a pawn of a more superior villain nor the victim of circumstances, so there was no sympathy to be found for this character. Everything about Scar from the movie spelled bad news, from his cold demeanor to his contempt towards the other lions. When Scar ruthlessly threw Mufasa into the murderous stampede of the wildebeest, my mouth opened in shock and horror as I couldn’t digest what had just happened as I watched the scene as a child. 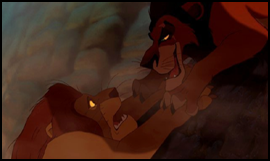 Scar was the cause of easily one of the most tragic scenes in Disney’s history: Mufasa’s death. He not only murdered his brother and attempted to off his nephew, he made sure to guilt that nephew into believing he was the cause of his own father’s demise. Yeah, he’s a bad one. But you wouldn’t know it from Kingdom Hearts 2. Scar, wherefore art thou? Scar appeared in Kingdom Hearts II as the Pride Lands’ main villain, in a land where Sora was unceremoniously thrown into the body of a mini-Simba look-a-like. The storyline was such that we missed the budding of the conflict. Sure, we had glimpses of the wildebeest stampede tragedy and we hear about how horrible Scar is from Nala, but that hardly translates to the experience of witnessing Scar’s terrible rise to power firsthand. The escalating sense of danger that accompanied that part of the storyline was taken away and all we were left with was a giant Pride Land mammoth Heartless…and our main villain, Scar, who had been reduced to a mindless drone. I’m talking about the very end when we finally get to confront Scar and he had turned into a Heartless. The newly fashioned Scar did not hold a candle to the one from Lion King’s memory. Scar did not taunt Sora’s team directly and didn’t treat us with full villainous intent as other villains had. Knowing what we would accomplish, he should have targeted us more, or try to maneuver our actions, such as trapping Donald and Goofy into an elephant bone cage or something. I guess Scar never addressed Sora as much of a threat; little good that did him. The best villains are those who are so sure and confident of themselves that they could taunt or coerce you into self-doubt. These villains are enraged by past history with your character and fuel their power with that rage and drive for revenge. When I’m up against a formidable villain, I get a sliver of fear eroding away my bravery because I’m unsure whether my opponent would pull some dirty trick on me. Yet, when I know I’m fighting a pure force of darkness, one who fights on primal instinct without that mode of personality, it feels like any other day or any other Heartless. Scar, you’re not Disney’s Scar, you’re Kingdom Hearts Scar, and that makes a big difference. Sakuchan -That’s it, folks, for the Not-so-Villainous edition! But it’s not truly over yet! If there are lackluster or confusing villains, there has to be a balance of very apt, truly evil villains. Ones who know exactly what to do to get under your skin and ones who follow you like a plague until you get rid of them for good.